Eastside Catholic is one of the premier teams in the Nation this year. This is not their first time to the top of the Nations lists of best high schools. Of course, there is an amazing system at Eastside and the Coaching staff lead by accomplished Head Coach Jeremy Thielbahr. From the facilities to the boosters to the fans in the stands the Crusaders, like them or not, are the summit of HS football in the Pacific NW. This year it appears there is not another team ready to step up and take them down but time will work that one out. The 3-1 boys from Sammamish (WA) lost the opener against #4 Nationally ranked Oaks Christian 35-12 but were competitive in that opener. 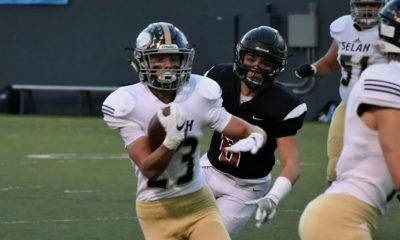 Since that game, they have not looked back beating Rigby (ID), Central Catholic (OR), and a tough Ranier Beach squad last week in the League opener. This week they face another superb football team in Garfield (WA) who are lead by on the Nation’s top 5 recruits in Sav’ell Smalls and it promises to be a great game. Like all great teams, this one is loaded with talent. Many of those talented athletes hold D1 offers in sharp contrast to most high school teams where not 1 athlete holds a major college offer. The Crusaders are loaded and seem to be more so every year as more and more of the best of the NW show up to play for the private Catholic school. 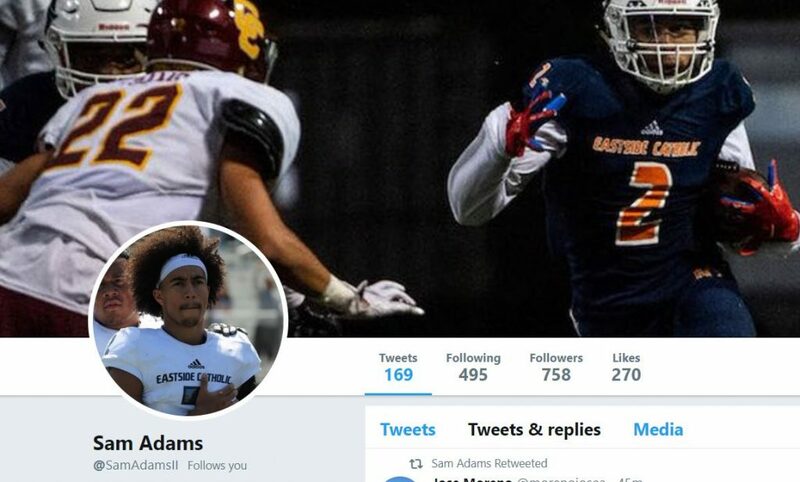 One guy that has really blown up this past Summer and now in the 2018 season is running back / defensive back Sam Adams. He is 6’2″ and 200 lbs and runs like an Olympic sprinter. There is so much to like about Sam who might be a bigtime DB or safety at the next level but many see him staying in that backfield where he a threat to run and catch the football. We loved the 4 game highlight that he just produced and wanted to share that with all of you. 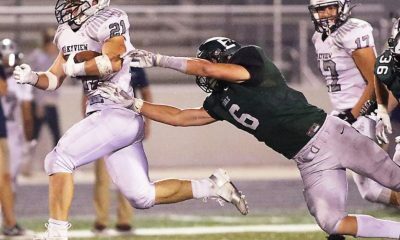 There is not one thing that stands out about Sam that defines him because he has the whole bag of tricks and his talent includes all the things we want to see in a Power 5 athlete. Speed is the thing- there really is nothing like it and Sam has it. The film showcases him picking a line and simply flying to the goal line passing defenders one after another like a test drive in a Ferrari weaving in and out of the orange cones. On other plays, he appears to be falling but has such great body control that he in a relaxed way flows through defenders like water. There is something very next level about Sam, watching him play is like watching Bruce Lee fight. You know you are watching someone with the rarest of gifts. Sam Adams is special. Sam is a 3 Star rated athlete in the Class of 2020 but that will be solidly at 4 Stars soon and could/should end at 5 if he continues to progress. He comes from a big-time football family with his father “Big Sam” Adams having played at Texas A&M before going on a 14 year NFL career. Big Sam was a defensive tackle and was a 3 time Pro Bowl award winner. Sam’s brother Terin currently at ASU. While Sam may not have his Dad’s size he will get thicker and it is easy to see how he could end up at 225 lbs or more and project to the linebacker spot. For now, we see him as an Eric Dickerson type of running back. 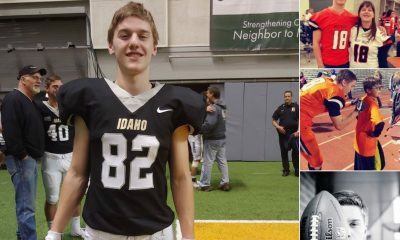 We wish Sam all the best as 2018 continues and unless something shocking happens we expect to see them at the Tacoma Dome for a shot at the 2018 WIAA State Football Championship. You know why coach Pete and DAWGS haven’t offered him yet? Coach Pete and his staff will always try to keep a kid of that talent in State. Their staff is closing out this year, coaching a Top 10 team every waking moment, and most big schools have stopped making too many offers as this is the time to win and earn that important Bowl spot. All part of the process. Patience is a virtue and all athletes and their parents need to attend games and work on building the relationships. All in good time … of that I am quite certain!